LG today unveiled an exclusive collaboration with Vanity Fair UK and British celebrity fashion photographer Ralph John Perou to bring to life L-Style, the brand’s new design identity, for style connoisseurs with an eye for great technology. An established portrait music and fashion photographer who has worked with personalities such as Katy Perry, Justin Timberlake and Helen Mirren, Perou helmed the style-meets-technology photo shoot that is to be featured in the July issue of the magazine. 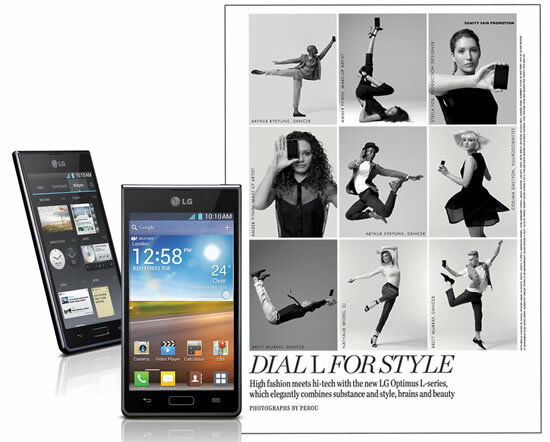 The series of black and white photographs showcases models in various poses with LG’s newest Optimus L-Series smartphones, illustrating the five elements of L-Style: Modern Square Style, Harmonized Design Contrast, Floating Mass Technology, Seamless Layout and Sensuous Slim Shape. The artistic concept behind the pictorial spread was jointly created by LG, Vanity Fair and Perou. LG and Vanity Fair each brought ideas on how technology and fashion can be best represented during the shoot while Perou married the two together seamlessly with his passion and creativity. The LG Optimus L-Series is designed for fashion-forward consumers who are keen to express their taste and style with their mobile devices. The series comprises three smartphones: L3 and L7 which were launched earlier this year and L5 which will be available in the second half.